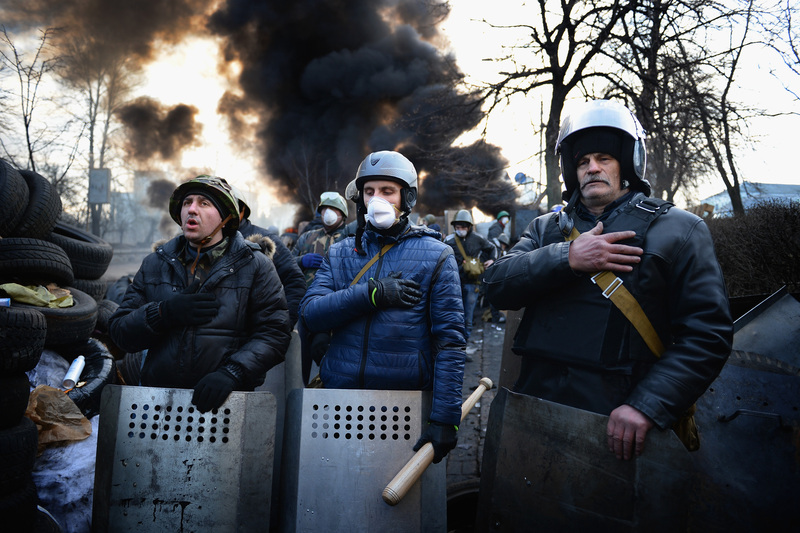 Ukraine Peace Deal Brokered Between Protesters And President, But Will It Hold? Let's hope this lasts. Ukraine opposition leaders agreed to sign an EU-backed deal with President Viktor Yanukovych on Friday to resolve the nearly three-month long conflict, which escalated into bloodshed and chaos in Kiev's Maiden (Independence Square) this week. The announcement came shortly after President Yanukovych said in a statement on his website that he will initiate early presidential elections and "steps that must be done to restore peace and avoid more victims of the confrontation." A spokeswoman in Kiev told the Associated Press that opposition spokespeople were on their way to the President's office Friday. EU foreign ministers from three countries participated in mediating: Germany, France, and Poland. However, the AP reports that even though the opposition accepted the deal, protesting masses swiftly rejected it, saying that it wouldn't be enough to heal the deep divides in Ukraine. EU ministers had won backing for an agreement from the council representing the opposition. The German Foreign Office Tweeted: "#Ukraine: After talks w/ FM #Steinmeier + @sikorskiradek #Maidan's Civic Council decided to mandate opposition leaders to sign agreement." The Maidan Council has been leading the movement. Polish Foreign Minister Radoslaw Sikorski was filmed by press openly telling an opposition leader: "If you don’t support this [deal] you’ll have martial law, you’ll have the army. You will all be dead." And on Twitter, he wrote: "We are about to sign. Good compromise for Ukraine. Gives peace a chance. Opens the way to reform and to Europe. Poland and EU support it." The agreement follows "Bloody Thursday," the most brutally violent period since the protests began in November. A truce declared Wednesday between the Ukranian government and the opposition crumbled just hours after Yanukovych's announcement. Devastating violence finally prompted the President to announce the country must work together to restore peace, and that he considers it his duty "to the bright memory of the deceased to declare that there is nothing more important than human life." But still, violence continued into early Friday, with fresh gunfire in Independence Square from security forces shooting at protesters. According to Reuters, opposition leader Vitali Klitschko said: "We are prepared to do everything to obtain a peaceful solution. I told the German foreign minister I would personally appeal to protesters before signing. All arguments must be considered before it comes to a signature." Meanwhile, a video posted to YouTube by a Ukraine protester calling for freedom for the country, "I Am A Ukrainian," has gone viral across the Web. The tape has seen more than five million views.